عندما تزور هذه المدينة رائعة الجمال، ستشعر أنك في بيتك في إيبيس بدجيت سانت بيترز الذي يقدم لك إقامة متميزة و خدمات عظيمة. يمكن من هنا للضيوف الاستمتاع بسهولة الوصول إلى كل ما تقدمه هذه المدينة النابضة بالحياة. يوفر العقار بفضل موقعة الجيد وصولاً سهلاً إلى أهم معالم المدينة.
. يعرف Accor Hotels بالمستوى الراقي لخدماته ولباقة موظفيه، وهذا ما ستجده في إيبيس بدجيت سانت بيترز. هذه بعض الخدمات الموجودة في هذا الفندق: تسجيل وصول/خروج سريع, واي فاي في المناطق العامة, صف السيارات, مطعم, خدمة غسيل الملابس. ادخل إلى واحدة من الغرف 105 وتخلص من عناء نهار طويل بمساعدة مجموعة كبيرة من الخدمات كمثل تلفزيون بشاشة مسطحة, بياضات, مناشف, اتصال لاسلكي بشبكة الإنترنت (مجاني), مكيف هواء الموجودة في بعض الغرف. يقدم الفندق خدمات رائعة كمثل مسار جولف - ضمن 3 كم, حديقة لمساعدتك على الاسترخاء بعد نهار طويل من النشاط والتجوال في المدينة. إن كنت تتطلع إلى إقامة مريحة وهادئة في المدينة، فستجد في إيبيس بدجيت سانت بيترز بيتك الثاني. We have stayed at a few Ibis Motels , was not happy with this one , very noisey, they have a sweet machine near the lobby that was so noisy when we left on Monday morning people were a the desk wanting to change their room . We put up with it for two nights , plus your morning staff was very rude , I always book with breakfast included she impolitey told us as we proceeded to go to the tea machine that will be $9 each thank you . Tried to explain I ticked breakfast she just wouldn’t hear of it , so we walked away very embarrassed . So no more . We chose to stay here as the tripple room was so much cheaper than within the airport. We arrived late at night, check in was easy. Parking was a bit difficult to find, we ended up having to park at McDonald's. No one likes these bathrooms but it's ok for a few hours. We left early the following morning after a quiet sleep. It is what it is a stopover type accommodation not the sort of place you'd want to stay for days. We'd stay again when flying. When I checked in the staff were totally unhelpful and not interested. I was given room 229 on the second floor. When I entered O was pleased with the room. Small but reasonable for the price. It was reasonably clean and everything worked. The window blind was strange and damaged it’s either totally closed or open. The bathroom is tiny and the toilet and shower in the same place( Handbasin is next to the window and bed on the other side of the room.) and the toilet smelt of urine. I spoke to the woman at reception who was very unhelpful. She told me housekeeper was gone and I should mention this when I see them the next day. I spoke to the guy next day who just brushed me off. So I went to the store myself and got cleaner to clean and deodorizes the toilet myself. So I will never never stay here again. Good things is parking is free and right outside the door and very close to airport and main road. Food outlets near by and public transport. We chose this place solely because it's near airport. Compared to other hotels or motels, it's not cheap but wrote average price. The entrance is not clear as there's no direct entrance from main road. Need to drive through KFC to reach the hotel's carpark. Good thing is that there's KFC on one side and McDonald's on the other. McDonald's is open 24 hrs so no need to worry about food. Room was a bit crammed though, compared to other hotels and motels we stayed in NSW. We was back here again after Canberra trip. Adam warmly welcomed us a again. He treated us like a 5 star customer. He helped us carrying them up and down, and kept them in the storage because there's no more vacancy in our room for these luggages. So appreciate to have him there. All the best to Adam, thanks so much again for your help! Adam- a very nice man welcomed us on the day we arrived. He helped us with many heavy luggages without a word, so impressed and so happy to have his helping. A room with everything basically enough for stay. KFC and Mc Donald just steps to walk, and bus directly to the city centre. Everything was as we expected. The downside was that the Wi-fi is not free. There was a problem withour booking for the shuttle bus but the manager refunded our fare and got a taxi as soon as the problem was recognised. it's located near airport but quite far from the city area. no issue for weekdays, but it takes 30 minutes on sunday to wait for the bus (422). room was nice, but I found a spider near window. Summer time I guess. I also love the vending machine (snacks & drinks), didn't bother to go out for snacking time :) the most important thing, It's located between mcD (24 hours) & KFC. The carpet on the corrider looks like it hasn't been cleaned for a long time. The room size is just fine. The shower area is a bit small. I'm petite but I keep on banging my elbow on the shower wall. Hot water in shower is working. 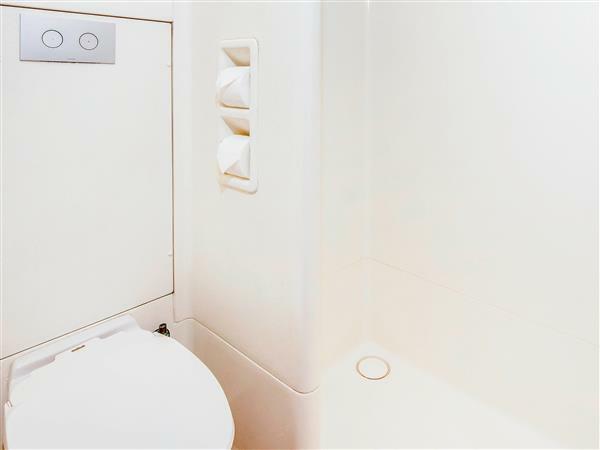 The wash basin is beside the room as there is no more space in the small bathroom. The tv and aircon are both working. No amenities, just soap and towel. Met a bug that I i immediately crushed. Totally a budget hotel that you can stay if you just need a place to stay for 1-2 nights. Would need to clean more. You know what you are getting with Ibis. The hotel is clean, with comfortable beds and plenty of parking. The rooms are small, but the facilities are adequate. 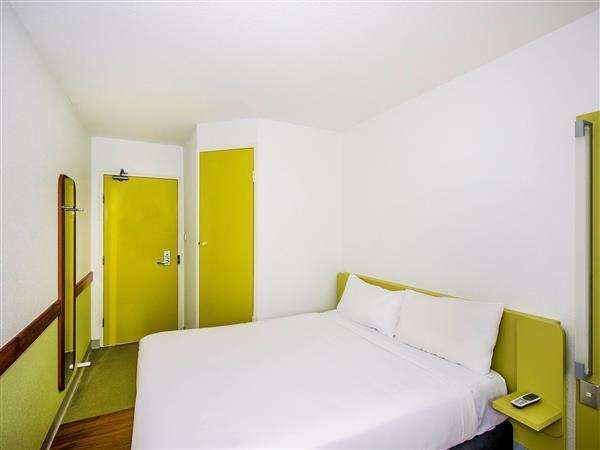 The Ibis St Peters is well located near KFC and Maccas and within walking distance of St Peters Station and the Southern Cross Hotel, an excellent place for dinner. location good for airport even for city (by bus). The bed is comfortable but the bathroom in our room has mould on the door. Also a bit noisy when the guest upstair uses the tap water late at night. We stay at this Ibis several times, in general it is good value. Good!close to airport And king street shops.. A little bit of mould needs attention in the shower.. I liked the fact that it was not too far from the airport. There are no elevators and I had a very heavy bag so I asked the guy that did the check in to help me get it to my room and he helped so that was good. It is situated between McDonalds and KFC which was nice. I also asked them to call a taxi for me which was nice. The room however, was small and the bathroom was tiny. The toilet looked like a kiddies toilet. The bathroom reminded me of the bathroom which I took a cruise. No public transport access, driving or by taxi is a must. No supermarket or convenient stores nearby, buy all the needies before check in. Only 24 hrs McDonald's or KFC (not 24 hrs) next to it, if you want no fast food, eat before you come to it. No washing amenities, e.g. Shampoo/ tooth brush / tooth paste/ shower gel, remember to bring your own! 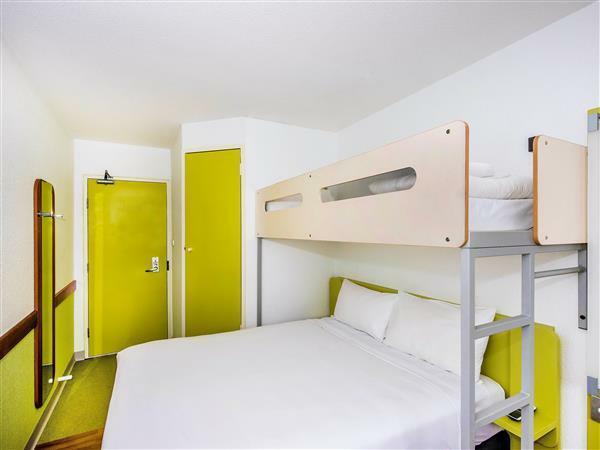 Two or three star hotel near the airport,clean,safe and normally priced under $100. It is an ex formula 1 hotel, small rooms, a capsule type shower toilet , plenty of food options nearby, a really good choice for inexpensive accommodation near the airport but only really for short time stay, also close to St Peters Railway for access to the city. 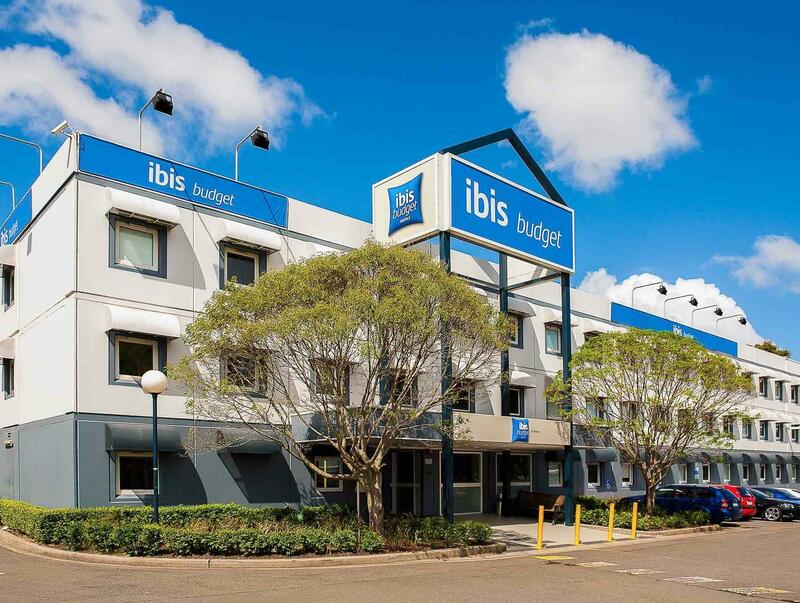 If you are use to staying at Ibis budgets, it meets the standard. Bed was comfortable. Paid more than what I wanted to pay for the room on that night. Others that were talking to the manager (who were staying 3 nights) were paying $99 a room, $50 less than I did! Stay in many 5 star resorts over the last few years. This budget hotel has the best bed yet. Close to the airport, it's a great place to stay if you have an early flight. 5 minutes from the airport, and much cheaper than the big boys closer to the airport.